While only a handful of companies are deploying full scale enterprise communities for their customers: Microsoft, SAP, Dell, Oracle, HP, VMware, Intel and a few other sophisticated ‘web’ companies, a common industry solution is not yet available. Sean O’Driscoll, a former colleague of Robert’s runs the General Manager | Community Support Services at Microsoft, and is on a national tour to learn from the best community folks at corporations this week. Sean has over 15 years experience at Microsoft and is passionate about the Microsoft MVP program, a program designed to let the advocates shine. In fact Robert was a Microsoft MVP before he was hired. He’s truly the advocate of the advocates. We got onto the subject of the future of company websites, and the challenges and features needed. He said the most important feature needed insn’t a feature at all, what’s needed is integration. He’s right you know, many companies are loosely putting together islands of social media software to try to build a holistic user experience. The caveat of course is that I believe corporations will never ever own the full customer experience unless they can own the whole web. 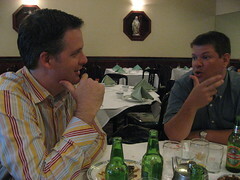 So while we should continue our endevours to build a comprehensives online community, we should also recognize that marketing and support has spread off the extranet to other areas of the web, areas we will never be able to ‘control’ like Facebook, MySpace, Blogs, and even your competitors extranet. So, as much time as you spend building the integrated experience, spend equal amount of time joining communities where they already exist –the future is distributed. Sean is on a mission to find out which corporations have built a holistic community experience for the enterprise, I’ve listed out a few companies above, but if you know of any (or want to brag) please leave a comment below. 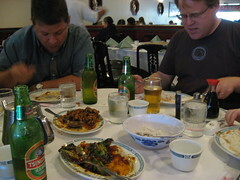 Enjoying Americanized Chinese food at Palo Alto’s Jing Jing’s with Sean, Robert.